In the 1930’s the land of the Pightle and the surrounding fields was used mainly for grazing – as it had for hundreds of years earlier. At the start of the Second World War there was a great demand for gravel to build the airfields which surrounded St Neots, so the whole area became a series of gravel pits. This made it useless for grazing. Further gravel was used in the construction of the original Little Barford Power Station. After the war it was decided to fill in all these pits with coal ash from the power station, which at that time was a coal burning station. This took about ten years and the only pit left today is the one in Bedfordia Meadows which you can still see today. When all the pits were filled, a thin layer of topsoil was spread over and the land was handed back to the original owners. It was in a very poor condition and only supported rough grazing. You can see a lot of evidence of this around the rabbit holes in the Pightle, where burrowing has gone through the topsoil and piles of ash have bene brought to the surface. The Pightle was bought in the late 1940s by a company called Sunny Smile who were relocating out of London, and who established a factory on part of the land that is now Capulet Close. They used to make baby toys which were sold by Woolworths. They used part of the field as a general dumping ground and if you dig in the front end of the Pightle lots of waste plastic can be found. Sunny Smile went into decline in the late 1970s and closed in 1987; no trace remains of the factory. The Pightle was subsequently used by Mr Carrington to keep his horses in but when this ceased the land reverted to scrub. In the run up to the celebrations for the year 2000, a project called Landscape 2000 was set up to protect and enhance green spaces. This project was particularly timely as in the previous years there had been a number of proposals to use the area for housing development - proposals which were vigorously opposed by local residents. 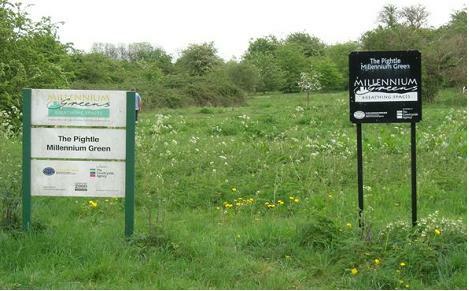 It was as a result of this project, with the assistance of St Neots Town Council, that the Pightle was bought and the Pightle Millennium Green Trust was created to look after it. Since then, the trustees have actively restored, maintained and enhanced the Pightle as a natural area for the enjoyment and recreation of the community of Eaton Socon. 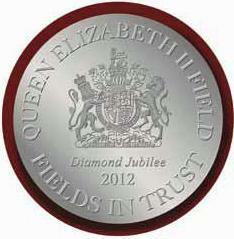 In 2012 the Pightle was awarded Queen Elizabeth II Fields in Trust Status and received the plaque pictured here to display. It is mounted in the pathway at the entrance to the Pightle. The Fields in Trust project aimed to recognise 2,012 community fields as part of the Queen's jubilee celebrations and give them all extra legal protection from any possible development in the future, and the Pightle was one of the first sites in East Anglia to receive the award. The Pightle is also protected by a covenant placed upon it some time ago, making its future as a green space for all to enjoy as secure as possible.